Squares and teardrops necklace. 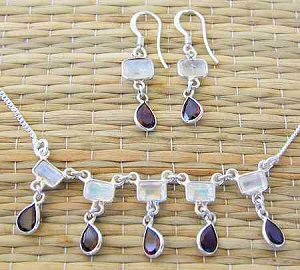 Square faceted Rainbow Moonstones with teardrop garnet dangles. Wire bezel set. This one's a guaranteed winner! Shown with matching earring E021. Sterling silver jewelry wholesale and handmade in India. Square earring with teardrop dangle rainbow moonstone with garnet.